Hundreds of members of the Communist Youth Union and local young people in the central province of Ha Tinh participated in a coastal cleanup campaign on the beach in Thach Hai Commune yesterday. It was one of activities in response to Youth Month 2019. Right after the launch ceremony, young people collected litter and then classified into different categories to make the beach cleaner. 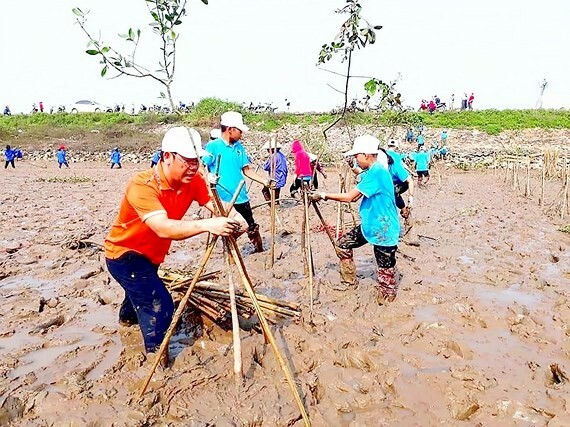 On the same day, in Dong Mon dyke in Thach Dong Commune, the civil construction project management board and the provincial Department of Education and Training organized a planting festival with participation of hundreds of students and teachers from junior high schools. Participants planted approximately 1,000 mangrove trees. In addition, the organizer enhanced information of restoring and developing mangrove swamp in the context of climate change.